Halloween might be over, but that doesn't mean we can't look back. 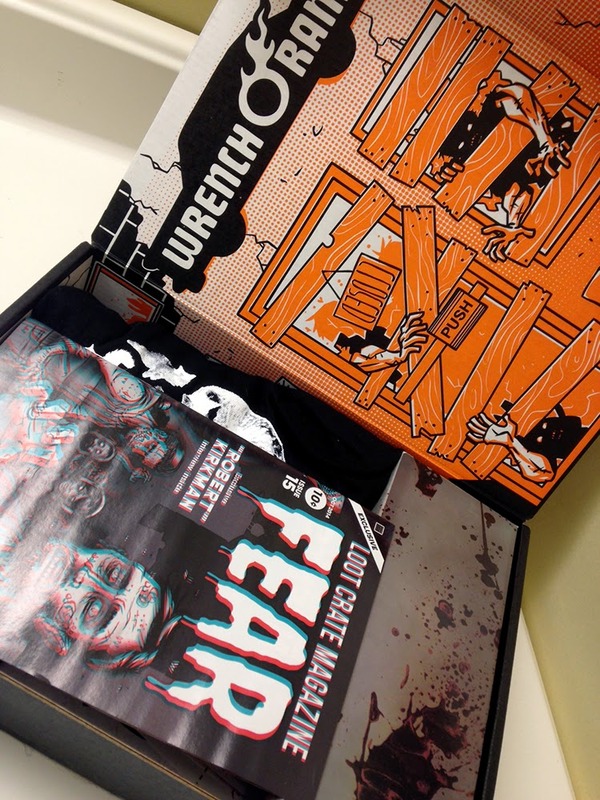 Loot Crate took an appropriate theme for October: horror. It's a natural fit. The box arrived around the third week of October but because I wanted a treat on Halloween, I waited to open it. I'm not the biggest fan of horror because I'm a wimp (I've seen few slasher movies and I don't plan on changing that), but I still found a couple of things in the box to appreciate. And regardless of the items meeting my personal taste, it was definitely a good value. Fear! This month's mini magazine has interviews with Robert Kirkman and JSalvador and some neat 3D illustrations (glasses are in the box). 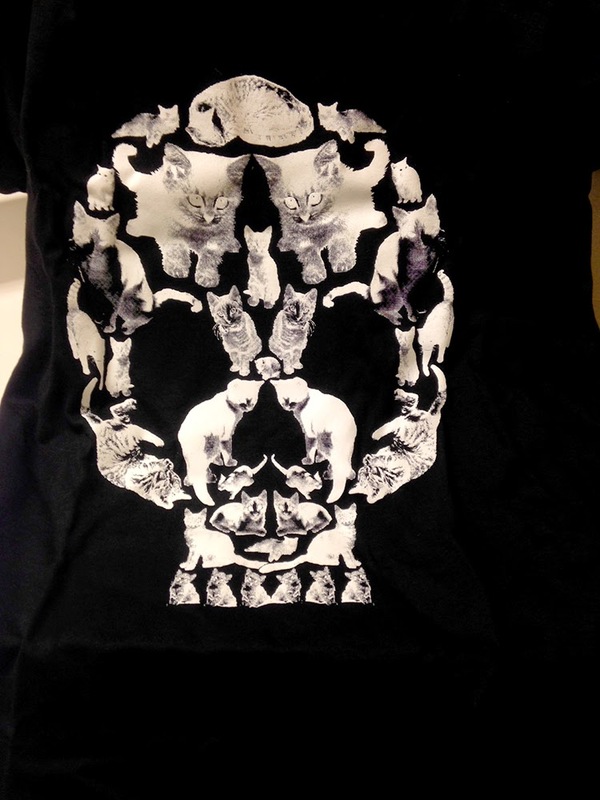 My favorite item in October's Loot Crate: a shirt with cats in the shape of a skull! The Death by Kitten t-shirt is from Super 7 and manages to be both morbid and precious. Are you worried about whether you would stay alive if a Sharknado actually happened? 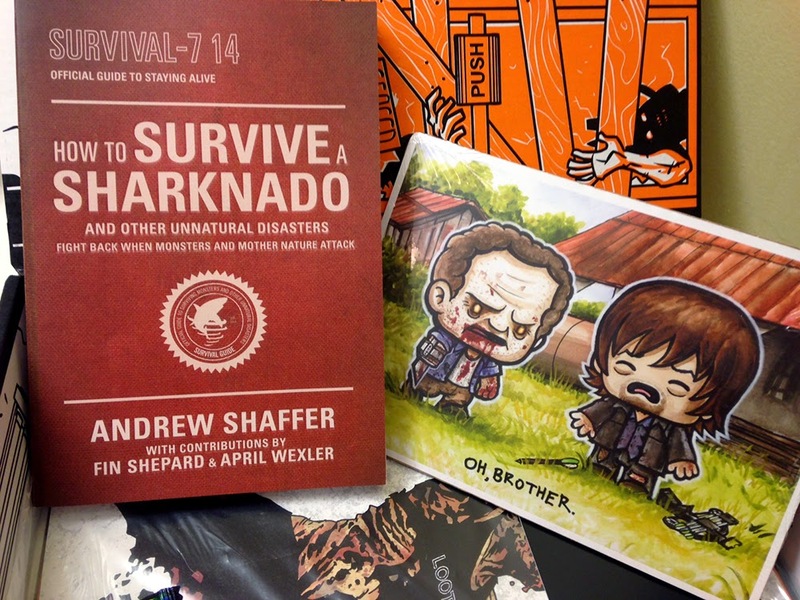 How to Survive a Sharknado and Other Unnatural Disasters will have you prepared for anything. Beside the book is another particularly cool item in the box: a super emo print by JSalvador featuring some cuties from The Walking Dead. If you're not familiar with Salvador's work, go browse his Etsy shop because it's packed with adorable moments from tons of franchises. Quick note: the print is on cardboard backing and wrapped in plastic and I appreciate that it was so well protected. 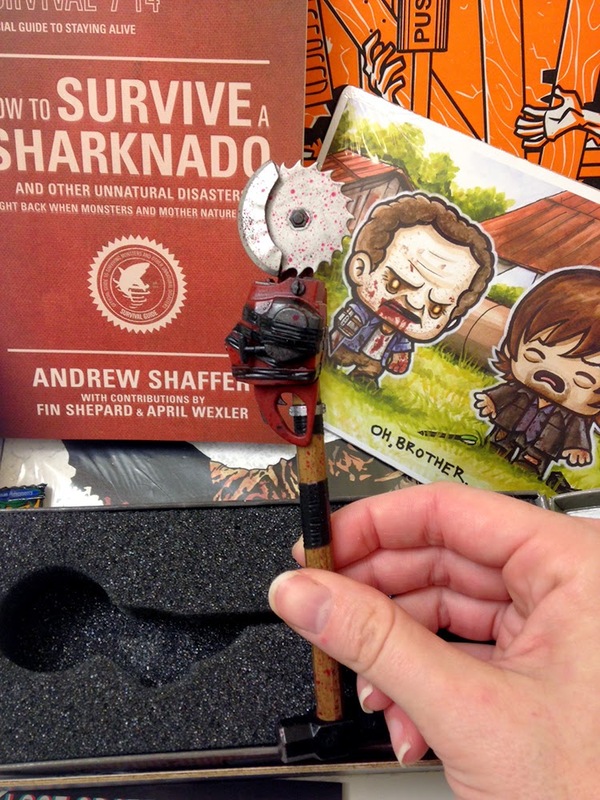 If you're familiar with Dead Rising 3, then this Sledge Saw pen probably makes you happy. Heck, it made me ooh and ahh even though I had no idea what it was. I just appreciate the craftsmanship and details. 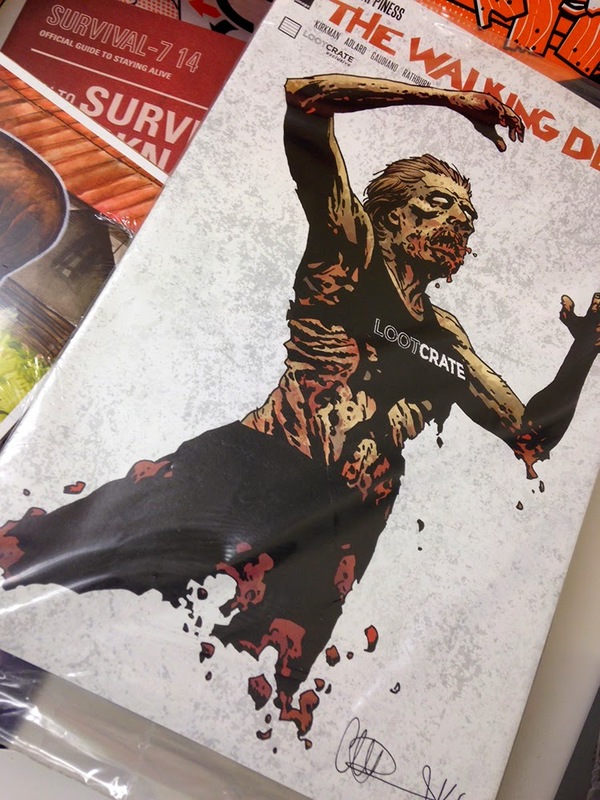 Loot Crate has a special edition of Image Comics' The Walking Dead. The cover art for this alternate of #132 is by Charlie Adlard. Finally, there are temporary tattoos with slashes and bites, a Smite Gift Card, some Toxic Waste sour candies, and a Loot Crate button. Between the t-shirt, the pen, the comic, the book, and the print, I'd put the retail value of this box around $45-50. And it only costs you about $19 with shipping and handling. Not too shabby at all. As I mentioned, most things in the box don't match franchises I'm interested in, but the retail value is there and I have some stuff to pass along to friends who like The Walking Dead and Dead Rising. 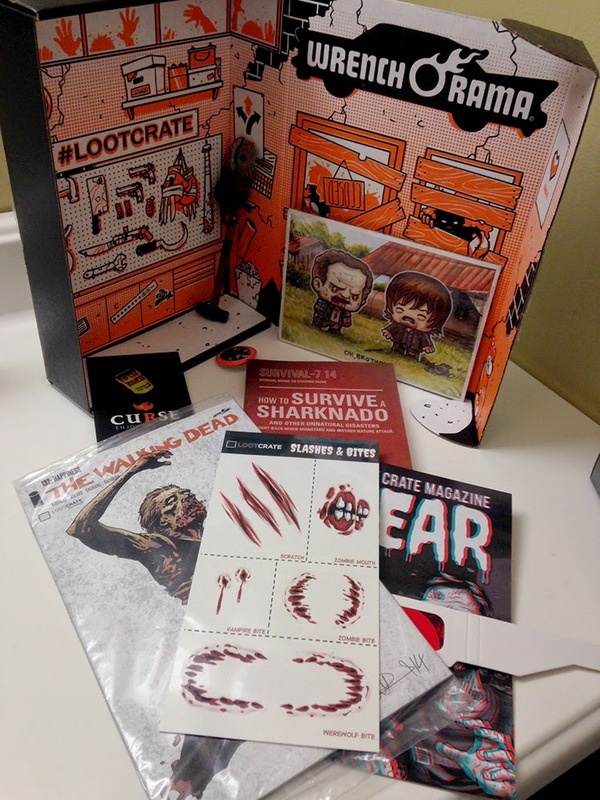 Curious about trying Loot Crate? November's theme is "Battle," and it's a good month to sign yourself up or to get a gift subscription for someone. You can subscribe for one month, three months, or six months - the rate goes down a little for each category. If you're not positive about the whole mystery box thing, I recommend trying one month at first. You can sign up right here, and be sure to use the discount code gwcloot to get $3 off! Huzzah! Happy unboxing! 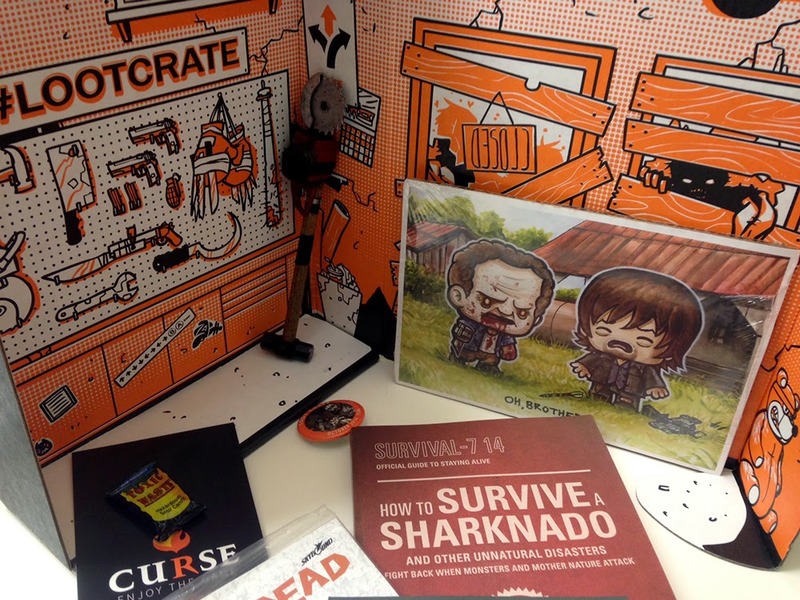 Full disclosure: This Loot Crate box was provided free of charge for review purposes. This did not affect my opinions. Your posts are very good and also Togel Online and Bandar Togel hope to benefit everyone and Agen Togel Terpercaya . New Episodes of Bee and PuppyCat Are Here!